However, this prevailing notion of software bots as primarily futuristic instruments straight out of science fiction doesn’t fully capture their potential within everyday workflows, such as robotic process automation (RPA). For example, bots could help transform supply chain management through RPA, which would eliminate manual processes across multiple applications and functions. RPA is most useful for highly transactional tasks executed in large volumes, such as managing invoices, returns and sales orders. It allows an enormous share of clerical work to be executed by a relatively small software implementation. The State of ePayables 2017 report, compiled by Ardent Partners, found that companies with process automation in place throughout their finance operations had invoicing costs 82 percent lower than their peers. They also were able to process invoices 71 percent faster, since they could entirely avoid the huge time investment and overall hassle of wrangling with paper documents. Still, there’s a ways to go in unlocking the full potential of automation: For example, only 51 percent of the survey’s respondents reported having linked their procure-to-pay processes to specific automated systems. Plus, the associated benefits might just scrape the surface of what’s achievable through broader transformation. More specifically, implementing automation that extends beyond finance and touches upon ERPs – including the many small and custom implementations that make up half the ERP market – and addresses organization-specific processes, like pulling data from customer and supplier portals or optimizing invoice uploading/downloading. The good news is that RPA offers an ideal path toward such wide-ranging efficiency improvements in accounts payable and elsewhere. The transformative value of RPA comes from the fact that its bots that can behave similar to humans, at least when it comes to working with common applications such as ERP, CRM and company web apps. Do you – or someone else at your company – spend a lot of time each working day coordinating the flow of information between different automated systems? Maybe you copy and paste data between Microsoft Excel sheets or discrete portals. Regardless of the specific actions taken, the overall approach fits the mold sometimes described as “swivel chair automation” – i.e., needing to pivot constantly between apps even though they are nominally automated. 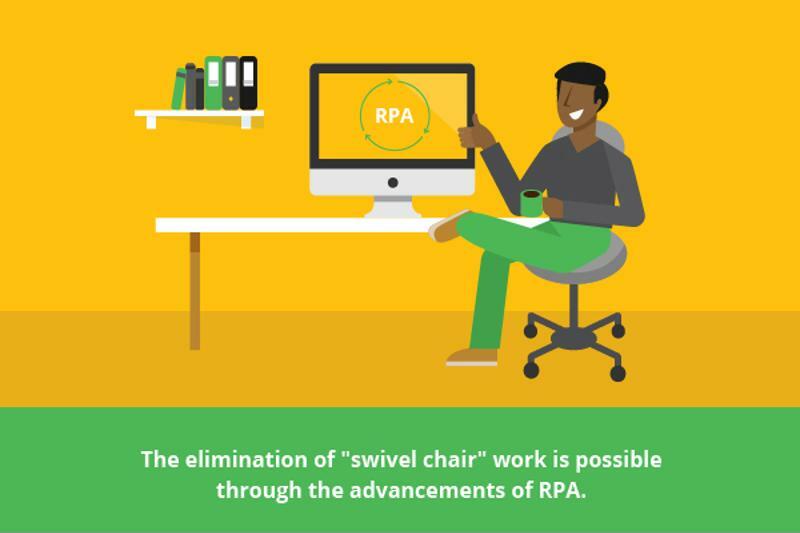 The elimination of “swivel chair” work is possible through the advancements of RPA. Unlike more basic types of automation, RPA works in tandem with technologies such as machine learning to account for context and patterns across large collections of data. This added insight ensures accurate, scalable and efficient automation of tasks spanning numerous applications. Machine learning is a rapidly growing market, making the professional skills related to it some of the most in-demand capabilities by companies in every vertical from marketing to logistics. According to Market Research Future, the machine learning sector is expected to expand at a 43.9 percent compound annual growth between 2018 and 2022. For RPA purposes, machine learning is integral to understanding how the different pieces of the automation puzzle work together without the need for a human overseer. A machine learning-enhanced workflow is defined by this capacity to “learn” details and actions free of supervision. Just as expert-level chess and go programs have benefited from machine learning principles, so too have RPA setups that string together information from multiple screens and programs within stable environments. RPA really thrives as the missing ingredient in quasi-automated activities, including dispatching service calls or performing financial closes, and as the glue between the different systems integrated with ERP solutions, which might otherwise require fragile IT-level integrations. RPA is one of several highly automated technologies currently enjoying prominence as IT organizations look for new avenues to efficiency improvement beyond the increasingly popular cloud computing. Blockchain (aka distributed ledger tech), the Internet of Things and artificial intelligence are also along for the ride; like RPA, they are relatively new and still in need of the years of development that helped cloud and earlier innovations like the web itself take off. As an experienced and trusted partner in supply chain management, Inspirage can help you get the most out of RPA and similar methodologies. We can ensure you make a smooth transition to cloud and properly integrate all of your most important applications. View our resource center or contact us directly for more details. This entry was posted in Cloud, Digital and tagged Cloud, Digital, IoT, Robotic Process Automation, RPA. Bookmark the permalink.